The AMX VTT/VCI was the first French APC and IFV (Infantry fighting vehicle). It was developed in the 1950s based on the prolific light tank AMX-13 after a specification of 1952 from the army for an APC, and two rejected prototypes from Hotchkiss. Designation changed several times, from Transport de Troupe Chenillé Modèle 56 (or TT 12 CH Mle 56 for short) in 1956, then VTP or Véhicule de Transport du Personnel for “personal transport vehicle” in 1957 to VTT in the 1960s Vehicule de Transport de Troupes for “Troop Transport Vehicle” to VCI today Véhicule de Combat D’Infanterie (“Infantry Combat Vehicle”) especially when armed with a QF 20 mm autocannon fed with AP rounds. This platform was the French most produced APC/IFV so far with 3,300 vehicles, and exported with the same success as the light tank it was based on. It was replaced by the more conventional AMX 10P in 1973 and is now retired in France, although several armies still use it today. The welded body used sheets of homogeneous steel armor, with a max thickness of 30 mm with a well-sloped frontal armor but the rounded nose and characteristic splash-board, borrowed to the AMX-13 chassis. It is divided into three compartments, with the driver and engine compartments at the front and the troop compartment at the rear. This rear compartment was completely modified to carry a central bench for an equipped platoon of ten men seated back to back, fully equipped. They had two rear access doors and a sloped roof with two additional two-piece hatch covers and four pistol ports per side (an innovation for the time). The infantry could either jump over the top or disembark through the rear doors, also fitted with pistol ports. The driver/co-driver had their own hatches and the driver single-piece hatch cover opened to the left and could see through three prismatic vision blocks covering the front and sides. The central one could be replaced by a night vision periscope. There was a tall superstructure just after the engine, and a rotating commander cupola on the left side, with four to ten vision blocks, depending on the version. This cupola was often modified during production to house a variety of armaments. One of the most current was the light turret (Tourelleau CAFL 56) developed in 1956-57. The superstructure front right was equipped with fasteners to hold storage. When the ARE (which is now part of Nexter Systems and previously Giat Industries and is currently prime contractor for Leclerc MBT) started production of the AMX-30 MBT, production of the complete AMX-13 tank family, including the AMX VCI, was transferred to the Creusot-Loire facility at Chalon-sur-Saone. The first prototype was built in 1955 at the Atelier de Construction Roanne (ARE). 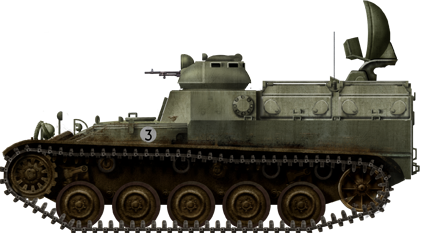 The first production vehicle came out the assembly line of “Atelier de Construction d’Issy-les-Moulineaux (AMX) in 1957 and was shifted to the main battle tanks AMX-30, while the VCI production was transferred to Creusot-Loire. The production was stopped in 1973 and the plant ceased its activities, while the VCI was replaced gradually by the new amphibious AMX-10P. However a modernized package was proposed for export by GIAT (now Nexter Systems) as the upgraded Model 1987 (new engine, night vision, new 20 mm autocannon). VTT LT For artillery spotting. VCPM 81 mm and 120 mm self-propelled mortar version. VTT Roland SPAAML version carrying a quadruple launcher and guidance radar. Around 2500 vehicles of all versions were used in France from 1957 to the early 1980s. Starting in 1973 the regular VCIs were gradually replaced by the AMX-10P. The light protection, lack of range, cramped interior, lack of NBC protection, amphibious or night vision capabilities were known tradeoffs for the AMX-13 chosen as a basis for commonality and cost. Some specialized versions were used well into the 1980s. Since it was armed with a 7.5 or even a 12.7 mm machine-guns, these vehicles were merely APCs, but became early IFVs when equipped with a potent 20 mm autocannon in the 1960s or AT missiles (ATGMs like the Milan or TOW). These were also proven adaptable and versatile. The country was given American-built M75 APCs in the 1950s, replaced by many VTT types, here denominated AMX-13 mod.56. These were the standard VTT (305), PC (72), Cargo (58), Mortar (90), MILAN (86) and ENTAC (30), both ATGM versions. They were retired in the 1980s, replaced by the M113 and AIFV-B. The Dutch Army used some 300+ vehicles, and among these the standard VTT, VCI 12.7, and the TOW version. They are now deactivated. Mexico has taken delivery of 401 AMX VCI DNC-1 series (ex-Belgian). These were overhauled prior to delivery by SABIEX International and the gun by SEDENA. The Argentinian, Ecuadorian, and Venezuelian armies also use the VCI today, but the Qatari and UAE vehicles are now probably retired. Sudan, Cyprus, and Indonesia (200 still in service) are also known users. The Lebanon army was given 30 ex-French VCIs in 1976, which were the only vehicles tested in combat against the Hezbollah and the Syrians. It was used either by the Army of Free Lebanon, the Lebanese Arab Army and captured and used by the pro-Israeli South Lebanon Army in 1984 (and deactived in 2000). Some up-armed with US M-46 106mm recoilless rifles were also uised by the Christian militias. French AMX VTP, early, main type armed with a single light AA-52 7.5 mm machine gun, 1957. AMX VTT 12.7 HMG with an open cupola (modified) and the 12.7 mm heavy MG, used by France and the Netherlands (here). French AMX VCI 12.7 HMG in exercizes at Camp de Sissone, 1987. French AMX-VTT with the Tourelleau CAFL 38 (turret) armed with the AA-52 light MG, 1960s. Netherland’s army VTT 12.7 HMG with the M56 heavy mount. French AMX-VCTB for Vehicule Chenillé de Transport des Blessés, the Ambulance version. VTT TOW used only by the Netherlands. French AMX-13 RATAC, the ground surveillance radar vehicle, developed in the late 1960s. French AMX-VCI M56, 20 mm autocannon version. Mexican DNC-1, a modernized version with SEDENA 20 mm autocannon, add-on armor and other imporovements, as of 2013.